Music has long been considered the universal language. It can influence moods. It can calm savage beasts. It can also tell a story or provide imagery for a story that’s being told. 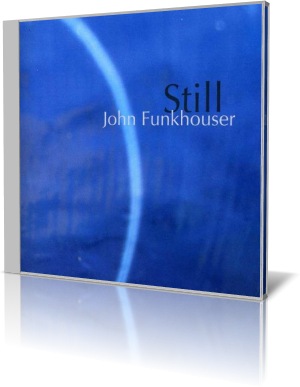 Still (Jazsyzygy Records, 2013) by pianist John Funkhouser is the latter type. The core trio consists of Funkhouser, Greg Loughman on bass and Mike Connors on drums. Guitarist Phil Sargent appears on three tracks, and vocalist Aubrey Johnson on two. “Indigo Montoya’s Great Escape” starts with a piano roll, then quickly kicks in the accompaniment. The trio goes through several gear-shifting moments, from fast and dramatic to peaceful – like an interlude between action scenes in a movie. One can almost visualize Indigo’s adventure from a hard-charging, open-field run to a stealthy, “let’s make sure there are no booby traps” approach. Interspersed are a few moments of planning and waiting for the sentries to move on. “The Deep” features Sargent and Johnson with the trio. It’s an easy-moving, haunting selection. The guitar has a slight, Pat Metheny quality. Funkhouser licks his chops to be sure, but Sargent carries the lead much of the way. The ethereal tones are ripe as the soundtrack for a diving expedition. However, after the midway point, the piano takes over, and the pace becomes frantic, signifying danger. Pirates? A school of sharks? Monsters from the deep? Whatever, it gets the musicians in flee mode. Once out of harm’s way, the group reverts to the tranquil, haunting mood the song began with. Johnson’s voice blends beautifully with the guitar. A native of the Boston area, Funkhouser was educated at Cornell University and New England Conservatory. He has taught at the Berklee College of Music. Also a bassist, he has been a featured soloist with the New England Philharmonic Orchestra and with the MIT Wind Ensemble. He has appeared on ABC television’s 20/20, NBC’s Today Show and NPR. Funkhouser is an associate professor at Berklee, teaching bass, piano, ear training and ensembles.